The UMass Motorsport Club was initiated in 1996 to promote motorsports at the University of Massachusetts Amherst. We have since created this event to bring together students, faculty, and community members alike, in the name of the automobile. 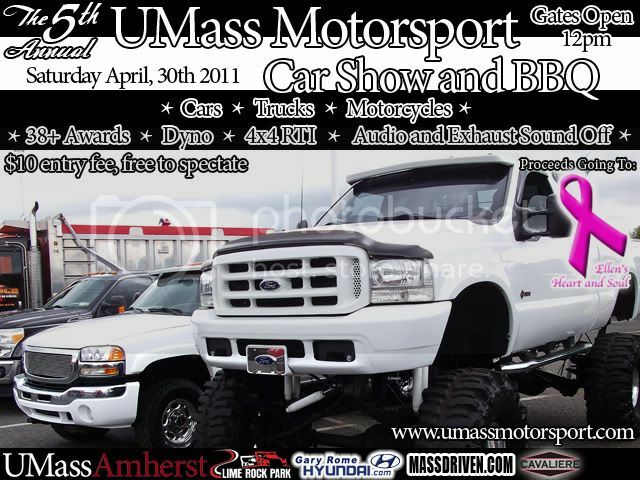 The 5th Annual UMass Motorsport Spring Car Show and BBQ will be a day to celebrate the automobile. Show: Free to spectate, $10 to enter a vehicle in judging. University of Massachusetts Amherst Campus, SouthWest Lot 33. If you are familiar with the campus, it is at the bottom of the horseshoe in the Southwest residential area. Show area opens at 12:00 PM and closes at 6:00 PM. Dyno open to club members at 9:00 AM and to general public at 12:00 PM. RTI 4x4 Ramp Contest begins at 2:00 PM. Judging Starts at 2:00 PM. All other vehicles arriving after 2:00 PM will be disqualified from judging. If you are unfamiliar it is the lot closest to where Mass Ave. and University Drive meet. (downhill from the towers). There will be signs directing traffic from the major roadways onto campus. From the North: Route 91 South to Exit 25 - At the end of the ramp turn left and follow the road to the intersection - turn right onto Routes 5 & 10 South - go one mile, then left onto 116 South, then eight miles to UMass exit - Left at the end of the ramp onto Massachusetts Avenue. Take a right at the first set of lights (usually blinking yellow) and proceed approximately one-quarter mile. Signs or the campus map will direct you to lot 33. From the South: Route 91 North to Exit 19 (Northampton/Amherst) - Right onto Route 9 and go approximately five miles, just past the Amherst-Hadley town line. Take a left at the lights (just after the Stop and Shop on the left-hand side) onto University Drive. Go through one set of lights and signs or the campus map will direct you to lot 33. From the East: Mass Pike (Route 90) West to Exit 4 (West Springfield) onto Route 91 North to Exit 19 (Northampton/Amherst) - Right onto Route 9 and go approximately five miles, just past the Amherst-Hadley town line. Take a left at the lights (just after the Stop and Shop on the left-hand side) onto University Drive. Go through one set of lights and signs or the campus map will direct you to lot 33. From the West: Mass Pike (Route 90) East to Exit 4 (West Springfield) onto Route 91 North to Exit 19 (Northampton/Amherst) - Right onto Route 9 and go approximately five miles, just past the Amherst-Hadley town line. Take a left at the lights (just after the Stop and Shop on the left-hand side) onto University Drive. Go through one set of lights and signs or the campus map will direct you to lot 33. If you have a group of 10 or more participating vehicles, you may preregister by emailing umassmoto@gmail.com. State your club name, the number of participants, and one member's contact information (phone number preferred). We would appreciate if you all arrived at the same time. If you are interested in becoming a sponsor or vendor at the show please contact umassmoto@gmail.com. Space is virtually unlimited. All donations are fully tax deductible as we are a Massachusetts State institution. 10'x10' Tent Space, 2 Car Spaces, Company Included in "Who's Coming" List Internet Advertisement. 50% discount available for local automotive shops, brand dealers excluded. 10'x10' Tent Space, Up to 5 Car Spaces, Company Logo on Car Show Staff T-Shirt, Company Logo on Internet Advertisement. 20'x20' Tent Space, Up to 10 Car Spaces, Company Logo on Car Show Staff T-Shirt, Name on Internet, Poster, and Flier Advertisement, Company Name on One Award Category, Office Plaque Stating Your Contributor Status, Your Website Link and Company Logo on Our Website's Main Page. 20'x20' Tent Space, Up to 20 Car Spaces, Company Logo on Car Show Staff T-Shirt, Name on Internet, Poster, and Flier Advertisement, Company Name on Best in Show Award Category, Office Plaque Stating Your Sponsor Status, Your Website Link and Company Logo on Our Website's Main Page. NOTE: Platinum contribution available to the first two sponsors who pledge funding. If you are interested in vending food, you must provide a required UMass Food Waiver. due to local and campus police strict enforcement of pedestrian rights and traffic laws. Campus police have full authority of the law. Feel free to Also Contact me Directly (through PM) with any questions about being a vendor/sponsor as well as event information. 01 Dodge Cummins EC/SB - Pretty much stock.